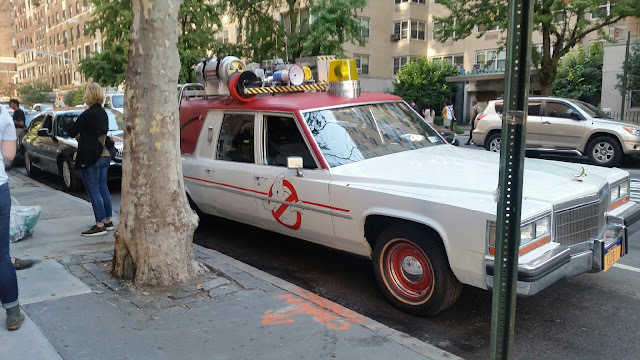 Da da da da da da da da da da Ghost-busters! Living in New York gets you all sorts of perks! Among many other things, it is a huge film location. You are always stumbling over Jack Nicholson or Adam Sandler or Kate Hudson or Robert Deniro (all of whom I have seen personally) or whoever you can think of filming this or that project that will hit the theaters in some coming month. There are no announcements, they are just there when you least expect it, with life flowing around the "set." They often are just part of the crowd, and most New Yorkers (like me) are sophisticated enough to give them their space and treat them like anyone else. Here are some shots from the set of the new Ghostbusters film, or at least of the Ghostbusters car. 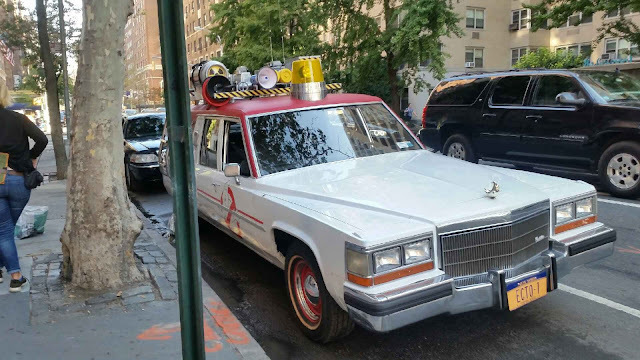 They are filming down near Washington Square Park on lower Fifth Avenue in Manhattan today (15 September 2015). These exclusive shots which you won't see anywhere else actually were taken on a side street nearby. Directed by Paul Feig, the film stars Melissa McCarthy and Leslie Jones, among others. If they are filming now, they likely will be out with the film next summer. Incidentally, they are telling everyone that the film is "Flapjack," an obvious code name. They like to film without drawing too much attention in order to ease crowd control problems and keep everything looking "normal."